Meet your personal guide on arrival at Wattai airport. After transfer to the hotel, start your tour by visiting the highlights of Vientiane: Vat Sisaket, the oldest temple in Vientiane with its mural paintings, Ho Prakeo, the royal temple turned religious museum. Proceed to That Luang Stupa, the most revered shrine in Laos and to Patouxay (the Arch of Triumph). Take a short walk along the Mekong River. Enjoy dinner at the restaurant in Vientiane offering a great choice of the traditional Laos food. After breakfast,you will continue the visit of Vientiane: the colorful Thong Khan Kham market then drive to Nong Bouathong, a silk weaving village before leaving Vientiane and drive along the road n° 13 passing many small villages. On the way stop to visit a typical Hmong Market. Upon arrival in Vang Vieng, transfer to your hotel. You have free time to discover Vang Vieng and the area. After breakfast, boat trip on the Namsong river, you will visit the Organic Farm then we leave Vang Vieng for Xiengkhouang. En route you will get an outstanding view over the mountains, this road is certainly one of the most beautiful in Laos. Stop at Phoukhoune with its lively market and fresh air. Arrive in Xiengkhouang in afternoon, proceed to the Plain of Jar, visit local market and transfer to your hotel. After breakfast, we leave Phonsavanh for Luang Prabang by a mountainous and windy road with breathtaking views. We will cross traditional and picturesque H'mongs and Kamu villages where we will stop to descover them in depth. 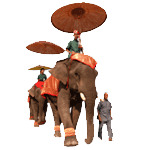 Arrive in Luang Prabang in late afternoon and transfer to your hotel. Breakfast then we will have a full day visit of the old city: start with Vat Vixoune influenced by Tai- Lu architecture and That Makmo, the watermelon shape stupa and Vat Aham just next, continue to Vat Sipphoutthabat with its fine carved doors and its view over the Nam Khan River. Walk through the small lanes up to Vat Xieng Thong, the most beautiful temple of Luang Prabang dating back from 16th century. In the afternoon, we visit the national museum, former king’s palace and Vat Mai with its five tiered roof and exquisite carved veranda. In late afternoon, we will climb up Phousy Hill for a bird’s eye view of the city and its mountainous backdrop. You have your free time to discover Luang Prabang night market. You have an early morning for the Morning Alm, the most impressive activity of Luang Prabang where the monks walk along the street and the locals offer them food. Back to the hotel for breakfast. After that, we go to the local pier of Luang Prabang to embark on traditional boat. Go upstream on the Mekong River and visit the sacred Buddha caves, Tham Ting and Tham Phoum. Stop off at local villages close to the river and experience the daily life of local people. Then we drive ahead out of town to the beautiful Kuangsi Waterfalls in the jungle. En route we visit the local villages of Lao ethnic minority groups at Ban Na Ouane and Khmou village at Ban Tha pen. One in the falls, you will enjoy the beautiful scenery, swimming or relaxing nearby the clear pools of the tiered limestone formations of Kuangsi. Drive back and overnight in Luang Prabang. After breakfast, free time until transfer to the airport for your departure flight. Breakfast is included in our service. If you want to include other meals thank you to mention it. Prices for trips vary depending on the type of accommodation chosen and the number of participants (more persons will lower the price per person). As a guidance, the typical price for this Laos tour is $ 688, based on 4 people in standard accommodations. If you want a quote based on your needs, please click the button below.